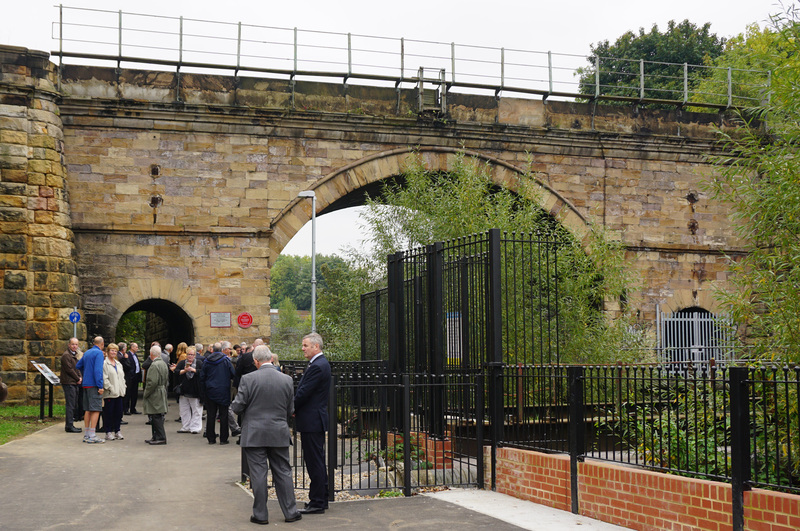 The mystery of Darlington’s Skerne Bridge was solved just in time for its grand reopening on 27th September 2017. 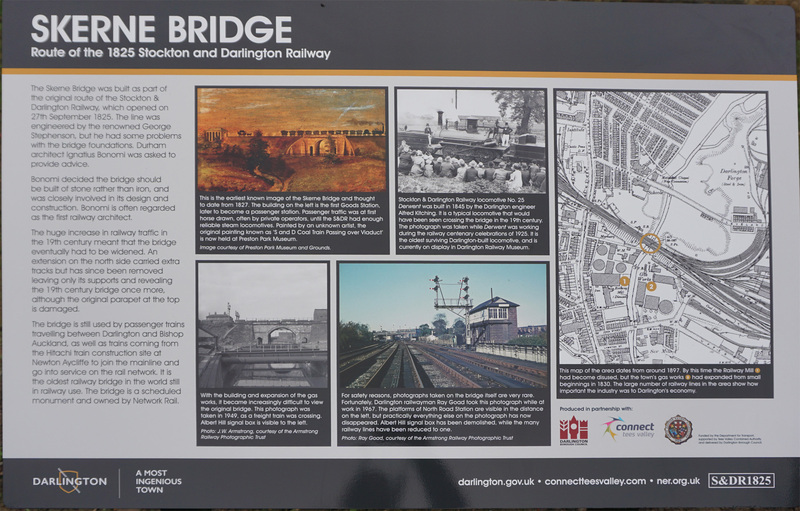 After years of neglect, the famous bridge has been revamped so there are now footpaths leading to it, a cyclepath going under it and an information board beside it. 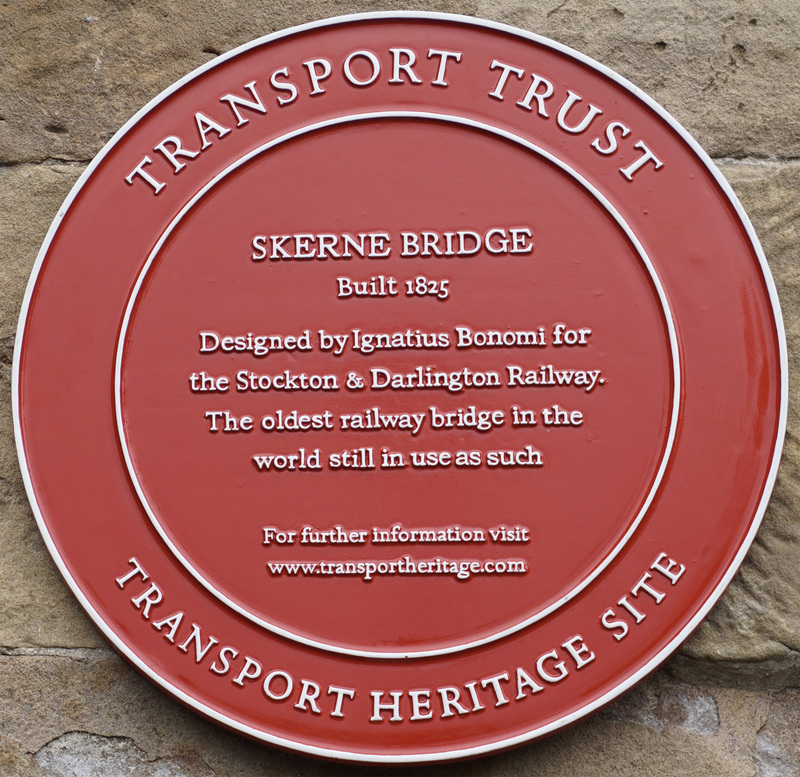 Skerne Bridge is a bridge of great history: it is the world’s oldest continuously operated railway bridge, and it was the largest piece of infrastructure on the world’s first proper passenger railway, the Stockton & Darlington Railway and it is the only bridge to feature on the back of a £5 note. But despite this fame, a contradiction persisted: why does the bridge look so humble on the only known drawing of it from its earliest moments, and yet on the most famous painting of it appears to be such a grand affair, with gracefully curving walls? Research by Brendan Boyle, of the Friends of the Stockton & Darlington Railway, into the minutiae of the railway minute books appears to have revealed the answer: soon after it opened, dangerous cracks appeared and it had to be shored up by a stonemason from Heighington. 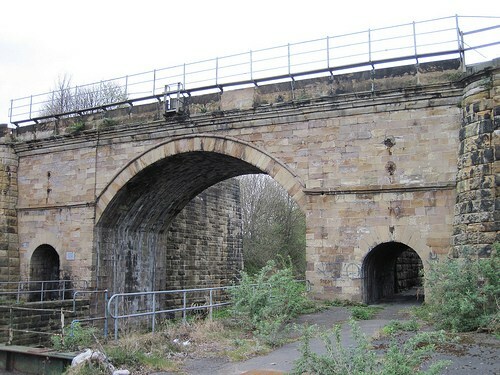 The bridge spans the Skerne at the north end of Darlington. 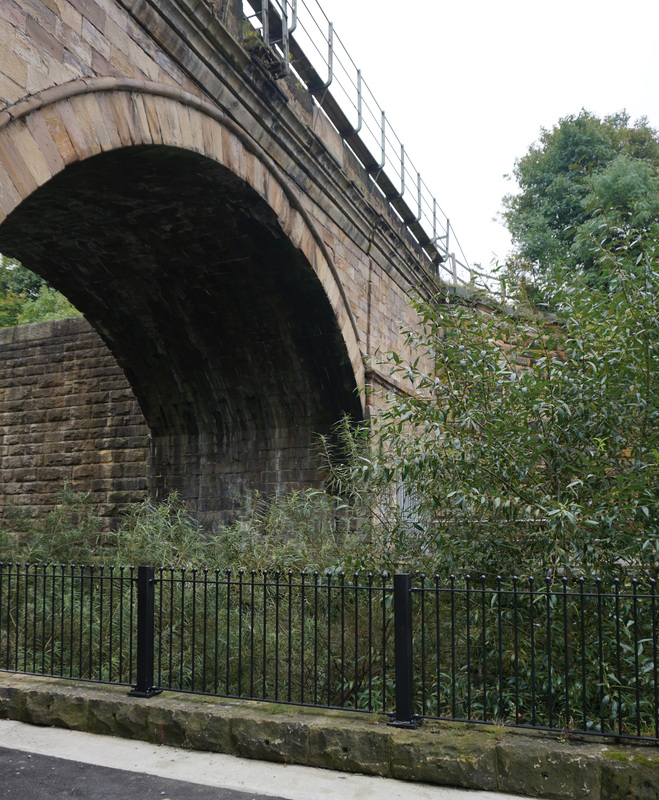 This was the biggest ravine on the Stockton & Darlington Railway, which opened on September 27, 1825. 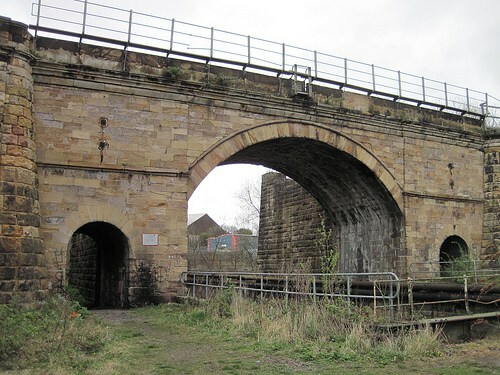 Initially, George Stephenson was briefed to build an iron and stone bridge across the ravine, but then his first iron and stone bridge over the Gaunless at West Auckland was washed away, so the railway directors had second thoughts. 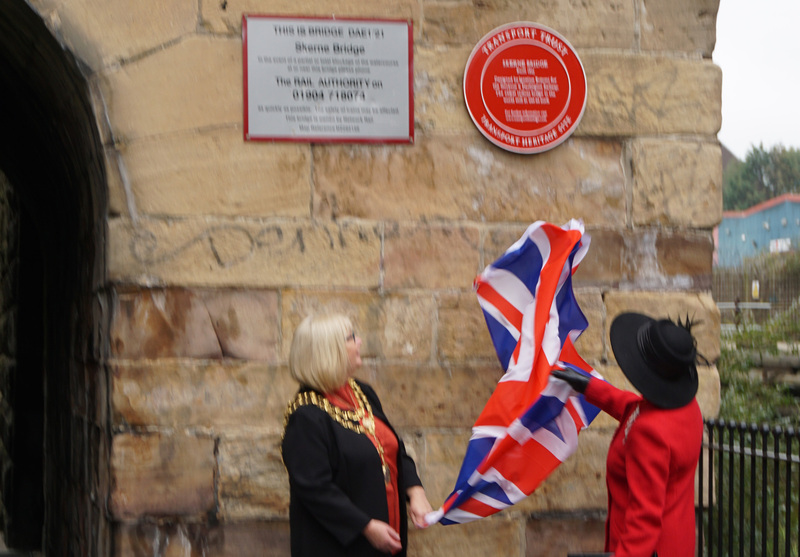 The price of iron also rose, so they ordered him to seek the advice of Ignatius Bonomi, the well-known Durham Cathedral architect who was also the county bridge surveyor. His plan was to fill the sides of the ravine with rubble and place a three-arch stone bridge over the river: a large arch in the middle and two small pedestrian ones on either bank. Francis Mewburn, the world’s first railway solicitor, laid the bridge’s foundation stone on July 6, 1824, and it was complete by early 1825. It cost £2,300 and, as befitted a Quaker railway, it was a simple affair. On August 26, 1825, a month before the line opened, the Reverend John Skinner came driving up the Great North Road. He was a Somerset vicar who liked to travel the country sketching antiquarian items – his sketchbooks are in the British Museum. As he ventured north out of Darlington, the new bridge, despite its simplicity, must have stood out like a sore thumb, and as it was such a curiosity – a railway, what will they think of next? – he sketched it. What really makes the S&DR important is that it was the first industrial-size railway in the world. Bonomi was undoubtedly very good at designing bridges for horses to trip-trap over, but no one anywhere had ever designed an industrial-scale railway bridge before. The S&DR had expected to carry 10,000 tons of coal a year from Shildon to Stockton and a few passengers, but by 1828, it was carrying 52,000 tons plus 40,000 people – huge weights were going backwards and forwards over the bridge. Brendan’s research shows that by late 1828, the embankments on either side were becoming dangerously damaged, and so the directors called upon their favourite stonemason, John Falcus Carter, to do some repairs. Carter, born in Heighington in 1787, had already built the world’s first railway themed pubs for the S&DR: The Railway Taverns in Darlington and Stockton, and the Locomotion at Heighington station (which is actually in Newton Aycliffe). Plus, he had built the St John’s Crossing weigh-house at Stockton, which now stands rather forlornly beside four lanes of road traffic on 1825 Way. 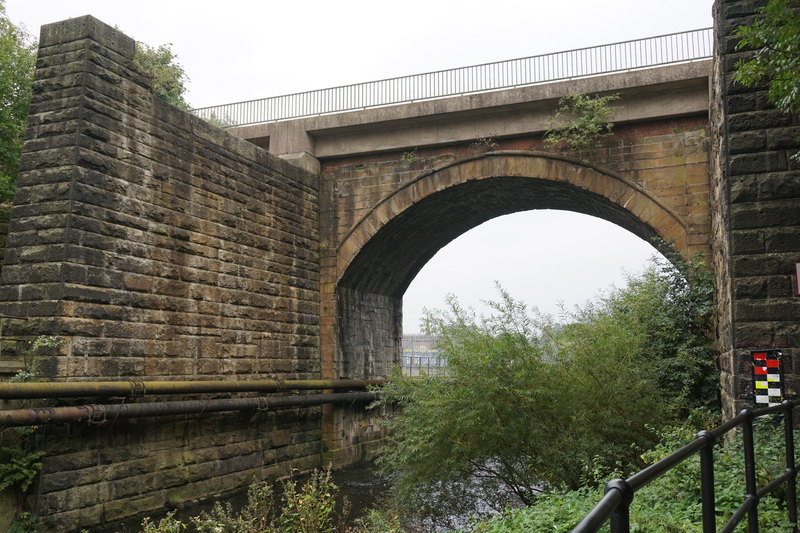 So in 1829, Carter added gracefully curving walls to the Skerne Bridge to hold up the embankments. His additions obviously worked, because in 1875, to commemorate the 50th anniversary of the S&DR, local artist John Dobbin was commissioned to paint an opening day scene. 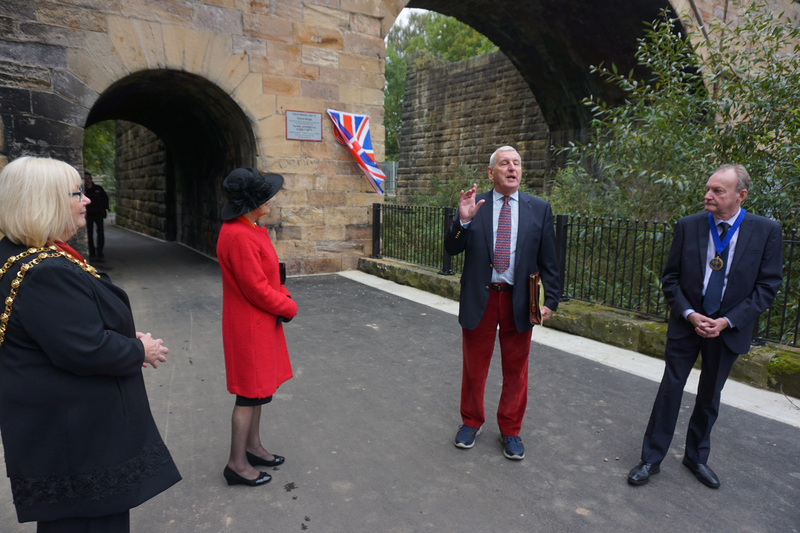 Dobbin, who grew up behind the Half Moon pub in Northgate, had been at the opening day when he was ten, so he remembered the buzz of the occasion but he couldn’t remember the details of the bridge. So to refresh his memory, he went back down and, assuming that bridges don’t change much with age, painted it complete with Carter’s curves into his famous image. Dobbin in 1875 may have been one of the last to see the southern face of the bridge in its full glory because soon a gasworks grew up in John Street, blocking the view. Large gas pipes were put across the river, obscuring the bridge, and the walks up to it were fenced off. It remained locked away for much of the 20th Century, despite its starring role on the 1990s £5 note, and even when the gasworks vacated the site a decade ago, the bridge looked too shabby and derelict for anyone to care. Now, as part of the Skerne valley cyclepath, the area has been cleaned, a new footpath has been opened up from North Road, and the mystery has been solved. What became of John Carter? Brendan Boyle’s research shows that he died on January 23, 1831, aged 43. He is buried in St Michael’s churchyard in Heighington. He left three small houses in the village which were sold to support his widow, Jean, and their six children. New Cycleway/Footpath under the bridge opened in May 2017 allows public access to previously private land. 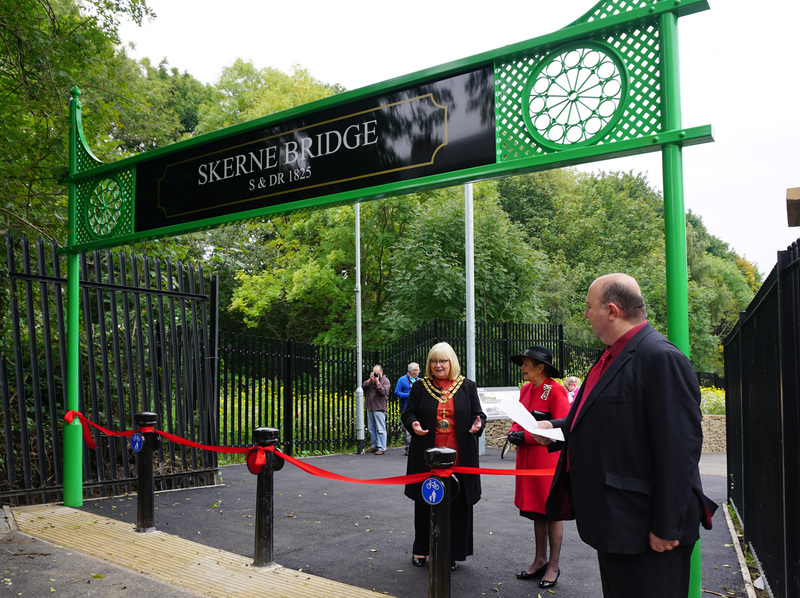 Skerne Bridge is the centrepiece of a cycle path network connecting Rockwell Nature Reserve and Haughton via the town centre. The pathway for cyclists and walkers leads from Darlington along Valley Street before joining the River Skerne at John Street, off Northgate. 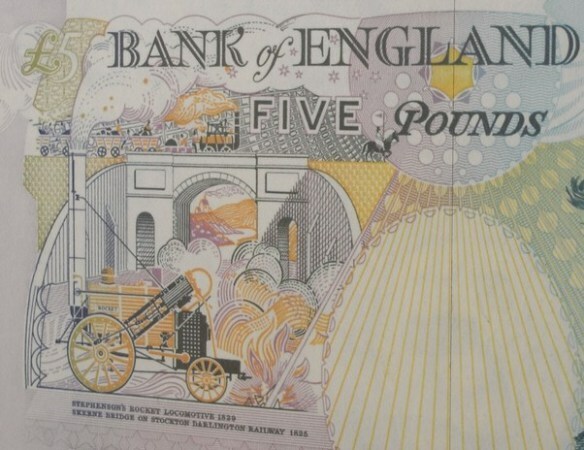 The riverside stretch was created specifically to incorporate the bridge that is a Scheduled Monument and appeared on the UK’s £5 note in the early 1990s after becoming obscured from view over the decades. Cyclists can travel along the length of the Skerne to the Rockwell Nature Reserve and the Haughton area from town or follow signs to the Harrowgate Hill cycle route network and go off-road for Newton Aycliffe.